In a pleasant turn of events I have had a few days off work this week so I put myself to (a better form of) work. Keeping it small and manageable I fleshed out a multiple block image I had in mind. This print ended up having three blocks with a variety of monochrome colours. The blocks were carved using a 4.5mm U gouge and a scalpel. At various points while carving out the skull and the mans mouth and eyes I needed to get my magnifying glass to make sure I got my lines right. Still I’m pretty happy with how it turned out. Three days satisfying work. The as yet untitled print does need some tweaking with the variations of colours. I might make the man lighter and more shadow-like and the skull darker and mix in some warmer tones when inking next. The print size is 17.5cm x 24.5cm. 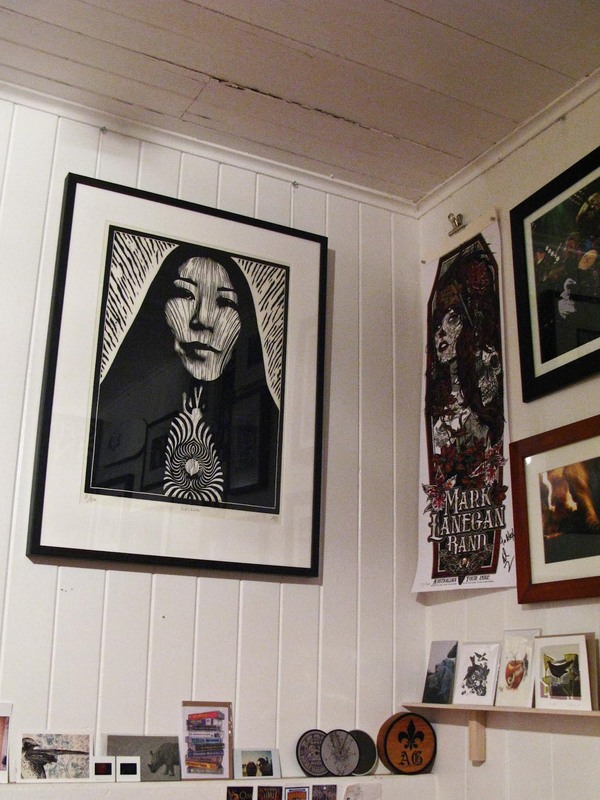 So fast forward a bunch of years to late last year and the always brilliant Outre Gallery in Melbourne releases a book called Tattoo Parlour which I swiftly buy because artists like Mike Giant and Thomas Hooper are featured. 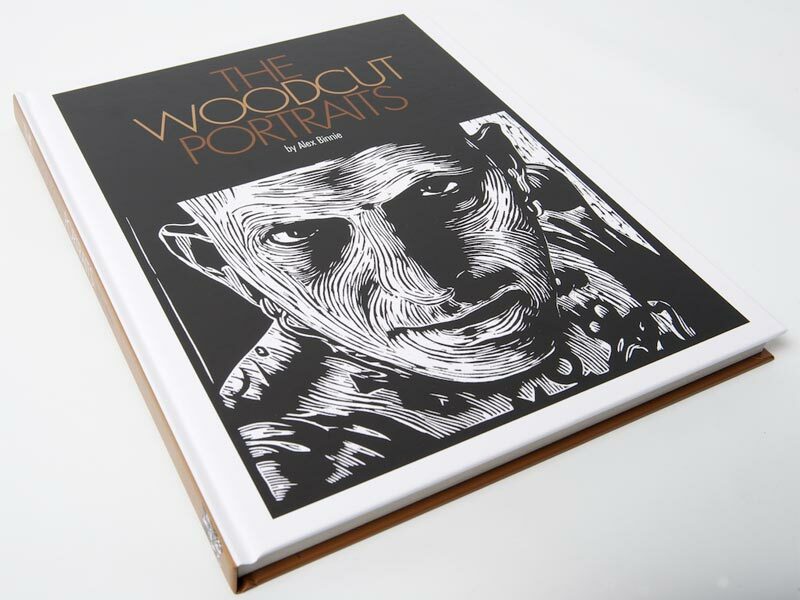 So right up the front of the book I discover the woodcuts of British tattooist Alex Binnie. We’re talking large scale portraits that are really striking. Basically we’re talking ‘new favourite artist’ here. So I do what most of us do these days, I read what’s in the book and then head straight to the internet to find out more about this brilliant artist. I find his website easily enough http://alexbinnie.com and after looking at his woodcuts I start to look though his tattoo work, what he’s done and his tattoo flash art. 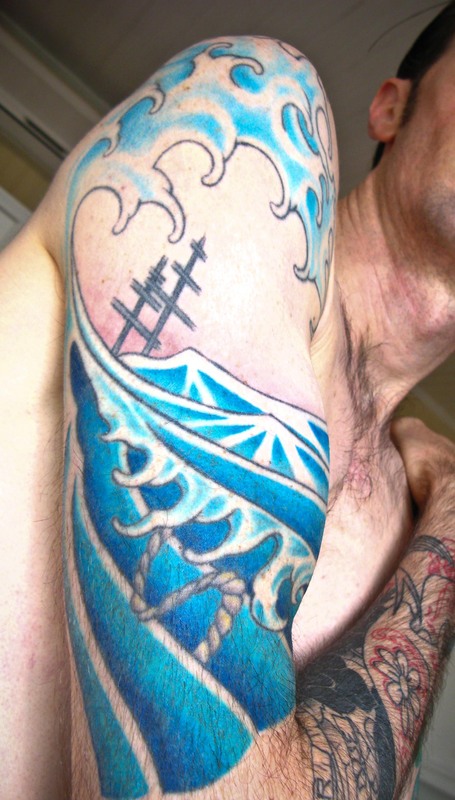 Then I come across this in amongst a series of 23 sleeve designs he did. Now, sure it’s not identical to my sleeve tattoo but I’m telling you, it’s the same basic tattoo design. 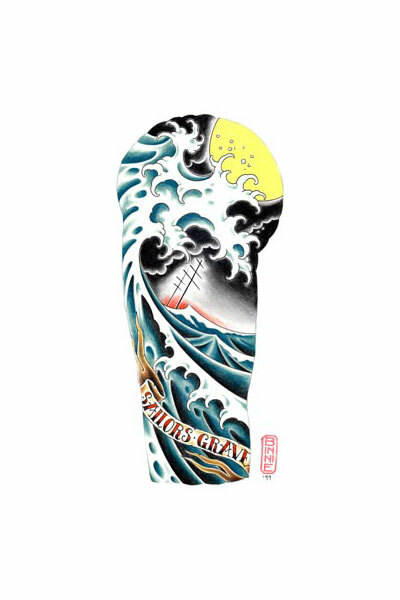 The wave, the curves, the ship masts, the red glow in the distance is all what’s on my arm. Basically what I discovered was that I’d been walking around with an updated Alex Binnie tattoo design on my upper arm without ever knowing that this man existed let alone that he made woodcuts as well as tattoo art. A few months passed and eventually I decided to get in contact with Alex Binnie. Tell him my story and my quirky series of discoveries. A few emails were exchanged and the woodcut circle grew a bit wider for me. 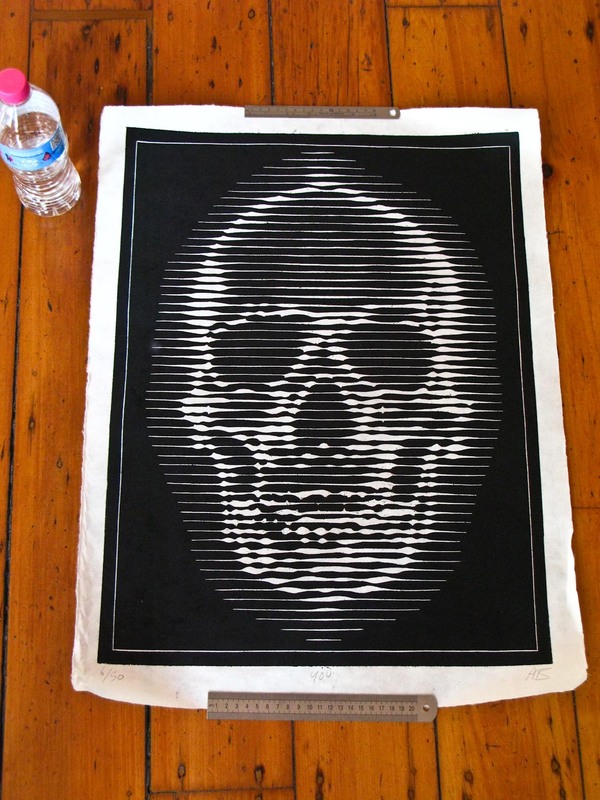 At the start of this year on my next trip to Outre in Melbourne, I bought one of his original prints titled ‘Chrisaki’. The style used to detail the facial features is not like anything I’ve seen in any other woodcuts. The whole thing as far as I’m concerned is brilliant. Recently we decided to do an art swap. 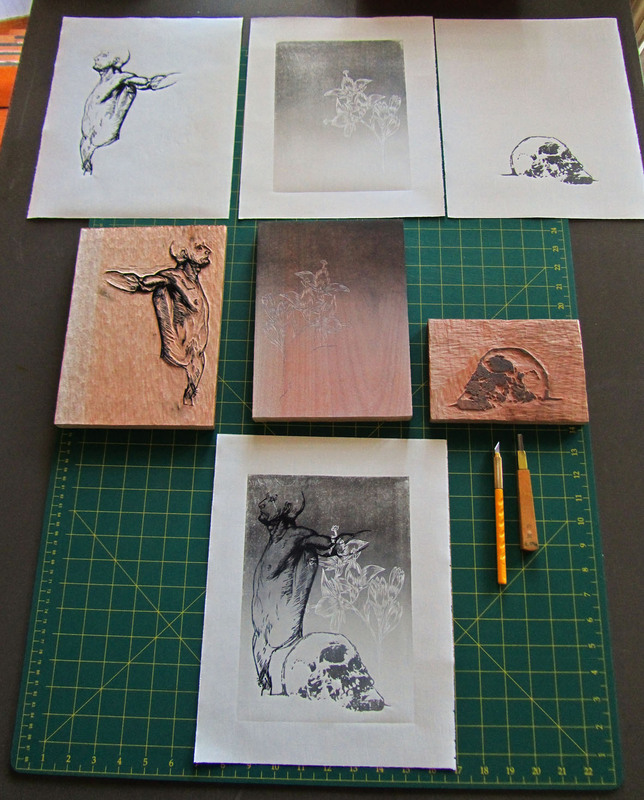 I sent him some woodcuts of mine, he did the same. And just last week this arrived on my doorstep. It’s huge and I really can’t get over how it is one distinct idea executed perfectly! Next I will frame it and give it a good home. Alex has also recently released this book. My copy hasn’t arrived yet but sure enough it will soon. I find these works inspiring and the great side effect of that is being pushed to do and try new things and try uncomfortable things. Finding art is as much fun as finding music… things that show you a world you don’t know! And so a bunch of happy coincidences (I guess) and I’m left with even more pretty pictures in my life… more than just the one on my arm that I’d been walking around with all these years. Go check out more at Alex’s website: www.alexbinnie.com or google ‘Alex Binnie’ to see his art and some more of his great tattoos.